Paul Krugman, Princeton economics professor, winner of the Nobel prize in economics for 2008 and New York Times op-ed writer is a person worth paying some attention to. Unlike most other mainstream commentators he does not deal mainly in cliches and often shows respect towards his readers by supporting his positions with hard data. He is also willing to take some risk by, on occasion, pushing against the envelope of mainstream propriety and using impolite words toward people with power. Of course, he is not without faults. Of course, none of us is. The point is that Krugman’s faults are not too different than those of many of his colleagues. In other words, while Krugman is somewhat of an exquisite specimen of the mainstream intellectual, he is still very much such a specimen. The Consumer Expenditure Survey (2007 data) shows (1, 2) that the higher a household’s income is, the more its members travel. Households whose income is above $150,000 a year spend on average about $4,000 a year on gasoline and motor oil, while household whose income is under $15,000 a year spend about $1,000. The BLS groups air travel together with cruiseboat travel and mass transit under the heading “public transportation”. Most of the amount under this heading is spent on air travel, with the proportion increasing with income. The amount spent on “public transportation” is therefore a good indicator of the distance covered in travel by air, and inequalities in the expenditure in this category can serve as lower bounds for the inequalities in air travel. The expenditure within this category is overwhelmingly by the rich. The top 10% of households account for about half of the total expenditure on “public transportation” – a proportion similar to their share in the total income. 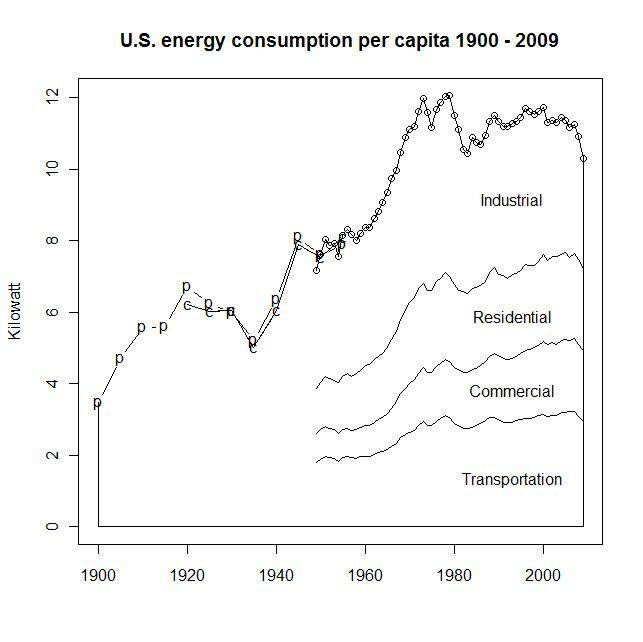 Data source: Energy information administration, End-Use Consumption of Electricity 2001, Residential Energy Consumption Survey. Data source: BTS National Transportation Statistics, Table 4-6. Update (Sept 1st, 2008): image updated to show 2007 data. Update (Sept 10th, 2009): image updated to show 2008 data. Update (Nov 2nd, 2010): image updated to show 2009 data. Energy consumption per capita in the U.S. is about 10 Kilowatt. For illustration, the power consumption of the human body is about 100 Watt (2000 Kilocalories per day) . That is, each person in the U.S. consumes on average 100 times more energy than that which is required for sustaining his or her body. Another point of reference is that 10 Kilowatt per person is what a family of four would be using if it would be driving its car on the highway for 14 hours a day (every day – 365 days a year). The per-capita power consumption level has not changed much since the early 1970s. While energy use for residential, commercial and transportation purposes have been rising (at the rates of about 0.2%, 1.2% and 0.5% per year, respectively, on average), these were offset by a reduction in the consumption in industry (by about 0.8% per year on average). Update (Feb. 2009): Updated links and data for 2007 (2009 Abstract). Update (Feb. 2010): Updated links and data for 2008 (2010 Abstract). Update (March. 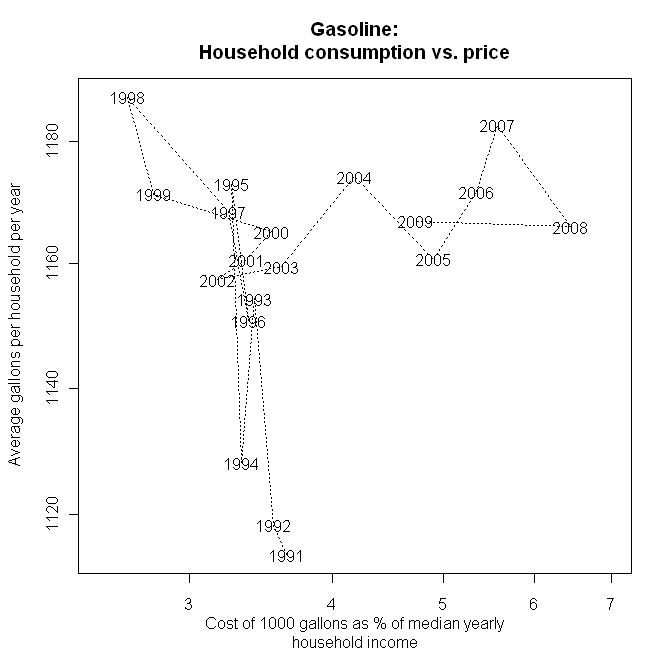 2011): Updated links and data for 2009 (2011 Abstract), and extending data back to 1900 (Data source: Statistical Abstract of the U.S. 1960, Table 686). Consumption data is available back to 1920 (marked by ‘c’), production back to 1900 (marked by ‘p’). This omnibus post collects draft fragments that are associated with the economy of attention and the sociology of science and expertise. This post is aimed at serving as something of a self evaluation of the first 6 months of this blog, and a statement of intent for its future. Abstract: LCD TVs are about as power efficient (i.e., they consume about the same amount of power per square inch of display area) as CRT TVs. Thus a 50″ LCD TV consumes about 4 times as much power as a 25″ CRT TV. However, LCD monitors are 2 to 3 time more power efficient (i.e., consuming 2 to 3 times less energy per square inch of display area) as CRT monitors. During a discussion about the popularization of large screen TVs, the claim was made that LCD TVs are much more power efficient per square inch than CRT TVs, largely offsetting the rise in display area to maintain a more-or-less constant total power. I was prompted to try to find information about the matter over the web.